Aunt Sylvia (Syvia) and I have been overwhelmed and grateful by the response of Yellow Star readers from all over the world. Thank you to each and every one of you. We have read all your letters and e-mails and have tried to get back to everyone. (If you haven’t received a response, please try again.) As of May 2015, Sylvia (Syvia) is still living in Rockville, Maryland. She and I talk on the phone frequently and are closer than ever. Sylvia celebrated a wonderful 80th birthday surrounded by family and friends. She volunteers at the United States Holocaust Memorial Museum in Washington D.C. Translated into eight different languages! “I will admit to you right here and now that there is a kind of children’s book I tend to avoid, if I can. 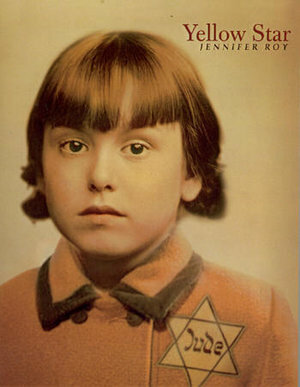 The Holocaust children’s book. I’ve read plenty of Uri Orlev in my time and I know my Anne Frank, but that doesn’t mean I look forward to reading this kind of literature. So when the buzz began ah-hummin’ around Yellow Star, I wasn’t exactly primed to listen. First one librarian began to sing its praises. Then another. Then a whole chorus of on-pitch clever librarians in syncopated rhythm. I couldn’t help but hear what they had to say. Apparently the book was so good that it sucked away about 20 minutes of discussion during a committee meeting in which we had seventy-some other books to talk about. Under such praise I had no choice but to locate myself a copy and read it myself. Normally when a book garners buzz of this nature, it has a very hard time living up to it. Jennifer Roy, however, should fear no such feeling. Her book has all the reality, depth, intelligence, and sheer compelling narrative to grab the attention of any child who is required or enticed to read this tale. Worth the hype, to say the least. “This is a true story. It was repeated to author Jennifer Roy by her aunt Sylvia, born Syvia Perlmutter. In 1945 the Lodz ghetto in Poland was liberated from the Germans. “Out of more than a quarter of a million people, only about 800 walked out of the ghetto. Of those who survived, only twelve were children. I was one of the twelve.” Told in verse, the book charts Syvia’s life between the ages of four and a half to ten. During that time we see the world through Syvia’s eyes. Her family was, like most Jews, rounded up and put into the Lodz ghetto. An attempt to reach ‘safe’ Warsaw never worked, and the family was forced to stay under grueling conditions. As the Nazis started to send off Jews to the concentration camps, including children, we watch as Syvia’s father uses extraordinary persuasion and intelligence to hide, protect, and help the children around him. Filled with close calls, luck, and a stifling oppression, this is a gripping narrative that brings the true horror of the time into fast and frightening relief. “Some librarians of my acquaintance got into a high-spirited debate when they tried to figure out why this book was catalogued as fiction rather than as a non-fiction memoir. To my mind, Roy may have had to change some small elements of her tale to make it into a readable work. Since the story is told in first-person verse and is a biography rather than an autobiography, it technically falls into the world of fiction, even if every little word written in it is true. “Maybe it was the fact that this was a real story or maybe it was Roy’s first-person narrative, but there is something about this book that feels more true than any other children’s Holocaust novel I’ve ever encountered. Granted, I haven’t read as many as I could, but Roy’s voice in this book hits a vein of reality, shocking in its immediacy. In cases such as this, I like to point out that depressing books aren’t my style. I was the kid in school who avoided The Bridge to Terebithia like the plague since I knew it was renowned for being ‘sad.’ But while Yellow Star isn’t exactly a laugh riot, but there are moments of levity to it. Rather than depressing, the book plays out like a thriller. Will Syvia be found? How can a small child escape or influence her own surroundings for the better? I don’t want to label this book an action-novel, but when this puppy moves, it MOVES. And the sheer heroism coupled against pure unvarnished evil is written in such a way that kids everywhere will not only be able to read it but understand it on a truly immediate level. All this makes Yellow Star one of the strongest children’s books I’ve ever had the pleasure to read. En 1939 los alemanes invadieron la ciudad de Lodz, Polonia. Obligaron a toda la población judía a vivir en una pequeña parte de la ciudad a la que llamaron ghetto. La rodearon con alambradas y colocaron guardias nazis para que nadie saliera de allí. En el ghetto de Lodz vivían 270.000 personas. En 1945 la guerra terminó. Los alemanes se rindieron y el ghetto fue liberado. Del más de cuarto de millón de personas allí recluidas solo 800 consiguieron salir con vida. Entre los supervivientes únicamente había doce niños. Yo era uno de esos niños. In 1939 vallen de Duitsers binnen in de Poolse stad Lodz. Ze brengen alle Joden samen in een getto en laten hen hard werken. Regelmatig worden mensen weggevoerd, zogezegd om elders te gaan werken. Maar niemand weet wat er echt gebeurt. 1939 marschierten die Deutschen in Lodz ein und errichteten ein Getto. Darin lebten 270.000 Menschen. Als das Getto bei Kriegsende durch die Russen befreit wurde, gab es 800 Überlebende. Unter ihnen befanden sich zwölf Kinder, die in einem Keller versteckt waren. Sylvia Perlmutter war eines von ihnen. Mehr als 50 Jahre sprach sie – wie andere Überlebende des Holocaust auch – nicht über ihre Erlebnisse. Dann entschloss sie sich, ihre Erinnerungen ihrer Nichte, der Kinderbuchautorin Jennifer Roy, zu erzählen, die sie aufschrieb. Eine berührende und unsentimentale Geschichte von Leben und Tod, von Grausamkeit und Hass, aber auch von Liebe, Mut und Zusammenhalt in der Familie. Como tantos outros sobreviventes do Holocausto, Sylvia Perlmutter ficou em silêncio por muitos anos, tentando esquecer aquilo por que passou. Mas, aos poucos, com a chegada da velhice, as lembranças começaram a vir à tona; Sylvia sonhava com a guerra e se lembrava constantemente do sofrimento pelo qual havia passado. Era hora de contar a sua história. Yellow Star is available as an audio book from Audible.com. Narrated by Christina Moore, it won the AudioFiles “Headphones Award” for Recorded Books. Download the unabridged audio edition of Yellow Star from Audible.